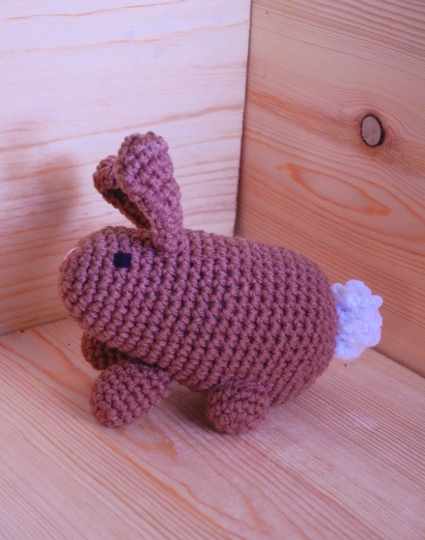 Everybunny loves a good rabbit, and this is a very good little rabbit. 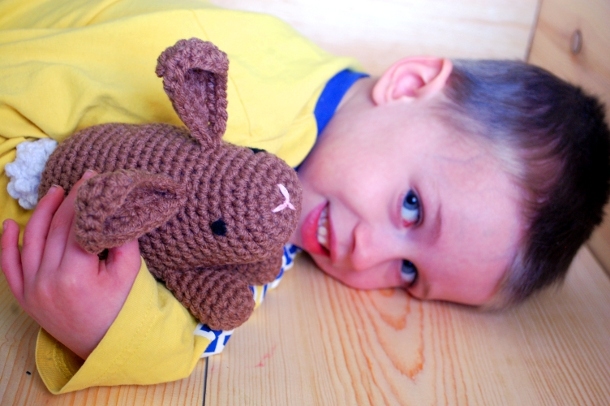 The perfect size for little hands to cuddle or to be tucked into an Easter basket, Mr. Cottontail is quick to make and a pleasure to play with. You’ll want to make a whole warren! 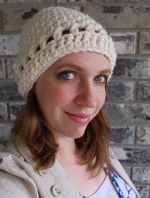 Gauge: 14 sts/16rows = 4″ in sc. Rnd 1: With MC, ch 2. Make 6 sc in 2nd ch from hook. Rnds 6-10: Sc in each st around. Rnds 12-15: Sc in each sc around. Rnds 17-24: Sc in each st around. Rnd 29: [Sc dec] around. (6 sc) Finish off, leaving a tail of yarn several inches long. Weave through the sts of Rnd 29, pull tight to close. Rnd 1: With MC ch 2; make 6 sc in 2nd ch from hook. Row 1: With MC, ch 4, sk 1 st. Sc in each ch across. (3 sc) Turn. Rows 2-4: Ch 1; sc across (3 sc) Turn. Row 5: Ch 1. Sc in next st, sc inc in next st, sc in last st. (4 sc) Turn. Row 7: Ch 1. Sc in first st, [sc inc in next st] 2 times, sc in last st. (6 sc) Turn. Rows 8-9: Ch 1; sc in each st across. Turn. Sl st evenly down side of ear to bottom corner; turn. Ch 1, sc evenly up around side, over top, and down other side of ear. Finish off. Rnd 1: With CC, ch 2. make 6 sc in 2nd ch from hook. Rnd 3: ch 1 *tr, sc. Rep from * around. (12 sts) join. Rnd 4: ch 1, *sc, tr. rep from * around. join, finish off. Pinch small ends of ears together; sew to head. Stuff front legs, flatten open end. Sew to underside of body. Stuff back legs, sew to underside of body. Stuff tail, sew to back of rabbit. Cut two small circles of black felt for eyes; sew to face. Embroider nose. Very sweet bunny. Thanks so much for sharing with us.